The heat wave may be over, but it's still relatively warm here in the South West so I thought a nice and cooling ice cream recipe would hit the spot. The idea for this ice cream was born when I read Bravetart's Crazy Banana Ice Cream post and just knew I had to try the concept of steeping ripe bananas in cream and milk for 24 hours to impart the flavour into them before getting rid of the banana completely. Bravetart used banana liqueur to enhance the banana flavour, but since I've already made a banana ice cream back in March (when we had that other week of warmth - that makes about three this year) and I've been more than a little obsessed with peanut butter lately, I thought I would add some of that to the banana-infused cream instead. I actually made the custard base for the ice cream a few days ago but didn't get round to freezing it properly today. My new ice cream maker seems to be a bit iffy as, even when I turn on the churner before pouring in the mixture, it freezes up the sides and makes the spatula get stuck before the mixture in the middle has even started to freeze. I'm not sure if this is maybe due to a fault or just poor craftsmanship, but I don't expect that kind of thing from a Kenwood machine. A stint on Google tells me that it's just one of the machine 'quirks' and to combat this freezing to the sides effect one has to leave the ice cream bowl out for 30 mins before using. Seems a little illogical, but hey, I'll let you know if it works. I forgot to put sugar in this ice cream, but it turns out it doesn't need it; the banana and peanut butter are enough to carry the flavour. The lack of sugar has led to a rock hard consistency, though, so if you plan on using a spoon and not an ice pick to get at the ice cream I would suggest leaving it out for 30 mins or so, or microwaving it for 30-40 seconds. Like me, you may feel compelled to keep the remains of the bananas, but honestly I don't think it's worth it. I kept the remains in the fridge at first, but didn't really want to eat cream-laden bananas when they weren't in ice cream so I ended up throwing them away. Peel and slice the bananas, then put them in a saucepan with the cream and milk. Bring to a simmer over a low heat, stirring constantly, then allow to cool before refrigerating for 24 hours. This is a good time to put the bowl of your ice cream maker into the freezer too. Remove the banana mixture from the fridge. Add the cornflour, yolks and peanut butter and whisk constantly over a medium heat until the custard starts to boil and has thickened. Strain the custard into a bowl and discard the banana pieces. Allow the mixture to cool completely and refrigerate it for at least 30 mins before freezing in the ice cream maker as per the manufacturer's instructions. Handy hint: exchange the cream for milk, add 80g sugar and remove the bananas and peanut butter and you have a recipe for custard to serve four. For more on cooking with less sugar, take a look at Healthy(ish) baking. 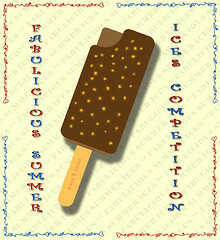 Having just learned about it from Choclette of Chocolate Log Blog, I've decided to enter this ice cream into the Fabulicious Summer Ices Competition over at Lancashire Food. One lucky entrant wins an Emma Bridgewater union jack cooler bag! Next week I'm going to try my hand at macarons, so stay tuned to find out how that goes!